1947 Rolls Royce Silver Wraith Sedanca De Ville. This luxurious vintage Rolls Royce wedding car can carry five rear seat passengers and one in the front next to the driver. There is an electrically operated division between the driver and rear passengers and the front can be enclosed. 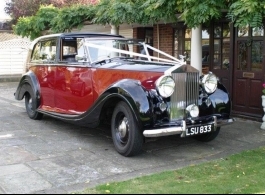 Enhanced by a beautiful Red leather upholstery and walnut woodwork, this vintage wedding car is a rare and unique Rolls Royce that will really add the wow factor to your wedding day photographs.